Two Sattahip-based Royal Thai Navy vessels have begun patrol duties near Somalia even as pirates from that lawless country continue to take cargo ships and their crews hostage. The warship Pattani and supply vessel Similan left for Somalia Sept. 10 for a 98-day mission. The Pattani has joined the 29-nation international patrol in the Gulf of Aden while the Similan has been tasked with escorting and protecting Thai cargo and fishing vessels. 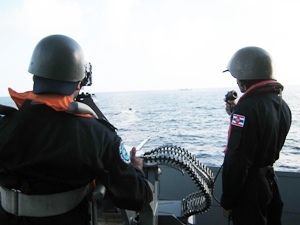 Thai warships have begun to patrol the pirate infested waters near Somalia. Ironically, the Somali pirates are using three Thai fishing ships hijacked in April as “motherships” for their stepped-up operations. The Prantalay 11, 12 and 14 – seized April 17-18 with 77 crew members on board – are now equipped with enough equipment to run three piracy crews each, complete with lightweight skiffs and ladders to scale the hulls of larger ships. The crews of those vessels are still being held captive in the Somali port of Kalaca. Navy officials said the two Thai ships have joined the patrol effort as a renewed “post-monsoon surge” has gotten underway. Knowing they can reap millions of dollars in ransom from shipping companies, pirates in recent days have hijacked the MV Asphalt Venture, a Panamanian-flag freighter with 15 Indian crew members, and an Iranian fishing boat. The pirates also nearly took the Maltese-flag MV Mississippi Star. But fighting off an assault that featured pirates shooting rocket-propelled grenades, the captain of the Star managed to evade capture. The journey to Somalia for the Pattani and Similan took about 17 days, with the vessels stopping in Oman to obtain supplies. During the stop, Rear Adm. Chaiyos Sunthornnak, who is commanding the mission, called on Thailand’s ambassador to Oman. He later paid respects to Sheikh Khalifah bin Sulman al-Khalifah, Prime Minister of the Kingdom of Bahrain, during a stop there.